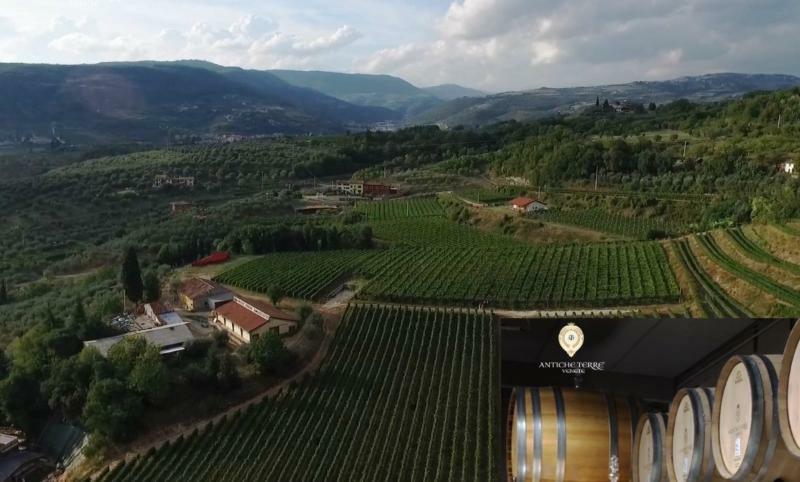 The history of the winery Antiche Terre Venete dates back to the early 1900s with Vittorio Sancassasi cultivating vineyards and olive trees on his land. When passion and work come together, they create unique life stories, like the one of Vittorio: A love for his land so strong that he devoted all energy cultivating the fields, vineyards and olive trees in Valpantena. The same vocation for wine passing from generation to generation, through his son Sergio to his nephew Luciano who, after an eclectic path of life, came back from China after having made vast commercial experience, and decided to follow the subtle calling of his homeland and its traditions. In these years Luciano's meeting with the Degani family forms the idea of uniting skills and passion under one name. The synergy between the enthusiasm of Riccardo Degani and the experience and knowledge of Luciano Sancassani have lit the spark of a winery that makes wine more than a business - a passion of life: Antiche Terre Venete. Intense, deep garnet red. Spicy of plum and cherry with a hint of raspberry. Soft, velvety, full bodied with a slight aromatic lingering aftertaste. Wine Spectator 90"A charming, accessible Amarone, with pure flavors of black cherry coulis and date, plush tannins and layers of baking spice, orange peel and licorice. Drink now through 2025. 1,865 cases made."